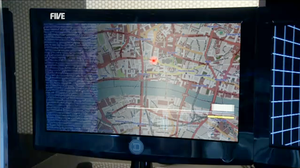 Above is an image of London, from the OpenStreetMap Mapnik rendering style, as it appeared in an episode of K9. K9 is a television series for 11 to 15 year-old children, produced by Stewart & Wall Entertainment. As OpenStreetMap contributors, we enjoy seeing our collective map used by others. The nice folks at Stewart & Wall Entertainment wanted to do more for OpenStreetMap than just use the map in their TV program. They have also written a nice note on their web site, thanking us all for providing a cool map. You should read the note in their news section because it suggests something very cool for the future. And they have added a credit on the series information page, too. Stewart & Wall have added a “thanks” to OpenStreetMap on the company credits page for The Bounty Hunter on IMDB. This entry was posted in Uncategorized and tagged "Who's a Good Dog? ", K9, LWG, Stewart & Wall Entertainment, Television on April 12, 2011 by Richard Weait. Was OSM listed in the end-credits too? This was a featured image a few weeks ago so I already knew and thought it was cool. But Stewart & Wall get bonus cool points for their support & publicity of OSM. It’s annoying that the map image is out of date (or rather contains unmapped areas) but I understand this is the case you have to accept with production-to-broadcast time line compared to OpenStreetMap’s energetic mapping activity. In the same way I’ll never be happy with a printed poster of OSM on my wall.